"With all that you have, why do you need wisdom?" "A man's nothing without it," Finn said. "With wisdom I'll know better how to help my friends. I'll be able to answer their questions where now I can only shake my head. If I was wise, I could speak for Ireland when the need arose." 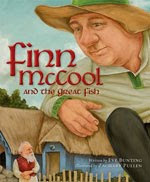 Finn McCool is a fine man in his community, willing to help where help is needed and much appreciated by his friends and neighbors. However, there are those who think that he is not too smart. When he hears the people talking about his lack of intelligence, he considers a visit to a nearby town and an old wise man said to have the secret of knowledge. The old man knows much about Finn and wonders why he needs wisdom when he already has so much. Finn recognizes the value of wisdom and the old man makes the suggestion that he should find a great salmon in the River Boyne. Once found, he should catch it, cook and eat it. Off Finn goes! Once the fish is caught, Finn is not so sure that eating it is the right thing for him to do; then, he decides against it. When Finn removes the salmon, his thumb becomes caught in the hook and his blood mixes with the fish's blood that is there. The fish speaks thankfully to Finn about his decision and reveals that he had been expecting him. He seems to know that Finn will use wisdom well, in the service of others. So, a promise is made and kept. He may be smarter; but Finn is still loved for his goodness, as he was prior to those fateful meetings with man and fish. The artwork gives readers a close look at Finn's size, his generoous and giving nature and the land where he lives. With changing perspectives, that include some detailed close-ups, Zachary Pullen adds interest and authenticity to this well-told folk tale. A story from a proud Irish writer, just in time for St. Patirck's Day. You might want to add it to the list you like to share with children at this time of year.